Knowing how to recognize the harmful and useful organisms that populate crops, being able to locate them on the vegetation and to evaluate their populations are fundamental skills to defending plants with techniques used in organic farming. The important thing is that monitoring is carried out with consistency and observational skills to be refined with experience. Monitoring is a practice that in agriculture consists of periodically observing crops. More precisely, in the context of the control of harmful organisms, this is a fundamental operation to ascertain the presence and the populations of the parasites (insects, mites, fungi, etc.) and, naturally, of their natural enemies (predators, parasites, etc.). to decide when to activate corrective measures or alternative solutions to the control technique used up to that moment. Monitoring allows to verify if the conditions of temperature and humidity of the cultivating environment are favourable or not to the activities of harmful organisms and their natural enemies, thus a need is to orientate towards different choices. 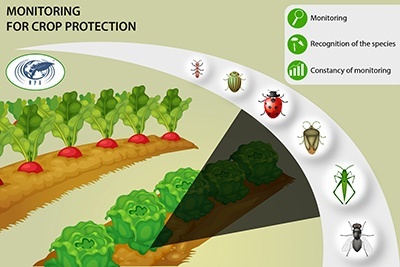 The recognition of species of pests and their natural enemies present on crops is the basic requirement for monitoring to be effective: if it is missing this assumption is difficult to manage well the defence of crops. For example, in the cultivation of aubergine, cucumber, pepper, courgette little is known when the crops are infested by the green aphid: it could be in fact a peach green aphid (Myzus persicele), which willingly attaches to many garden plants, both aphid of the potato (Macrosiphum euphorbiae), and the aphid of cucurbitaceae (Aphis gossypii). 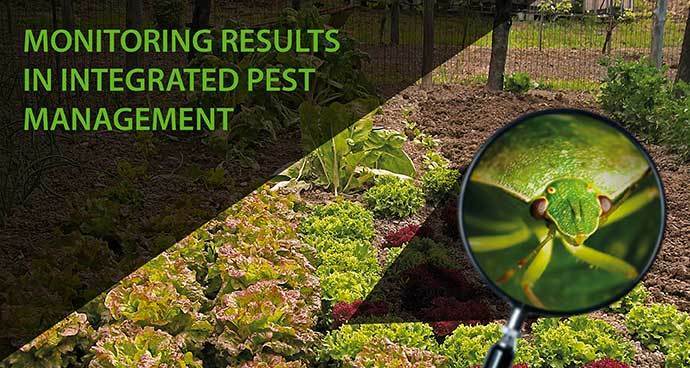 Therefore, if the characteristics of the crop pests (and their natural enemies) are not known, it will be difficult to identify a defence strategy suitable to solve the specific problem (such as the choice of technique, organic pesticides or natural enemies to use). In fact, there are parasites towards which some pesticides used in organic farming are not very effective: for example, pyrethrum is partially effective on aphid of cucurbitaceae (ie does not eliminate 100% of the individuals present so they can continue to reproduce), while effectively controls the potato aphid and the peach, green aphid. In the same way there are useful insects that control only some parasites: for example, the parasitoid Aphidius ervi controls potato aphids and not the aphid of cucurbitaceae and the peach, green aphid, instead, these are controlled by the parasite Aphidius colemani but is not effective against potato aphid. One of the basic requirements for correct monitoring is to recognize both harmful and useful organisms that populate crops. Not being able to recognize the organisms present on the crops also prevents the advantage of the activity of many useful organisms that are spontaneously present, which would allow the management of crop protection in a more effective and economic way. In this regard we recommend to consult some valid manuals and to always combine theory with practice, practicing in recognition also with field observations, perhaps with adequate equipment (portable lens and / or microscope). At our Permaculture Design Courses we spend a lot of time on the topic, directly on the fields observing the crops. It is important that the grower does not consider crop monitoring as a secondary practice, that is to say, to be carried out only if it takes time. This practice, as we have outlined in the introduction, must become an ordinary operation, to be included in usual practices. In fact, neglecting the monitoring of crops, even for only two weeks, can lead to more than a few problems: for example, in the absence of limiting factors (such as an adequate presence of natural enemies), with temperatures and favourable humidity, the populations of many species of insects, mites and fungi are capable of growing to levels that make control with the means allowed in organic farming difficult and expensive. It is much better to act in advance; this is why we recommend monitoring at least once a week. Determine the purposes of monitoring, that is to say what you want to know. For example: the moment of appearance on the crops of an insect or its natural enemies; the numerical consistency of their populations; further information on the biology or behaviour of a particular organism. Decide if, in addition to pests, there are other aspects that need to be monitored. For example, it might be interesting to correlate the appearance of an insect or the symptoms of a fungal disease with a plant development phase, or with particular values of rainfall, temperature or humidity of the air. Check whether the frequency of surveys that, as already mentioned, should be weekly, seasonal, or be increased or decreased depending on the climate, the degree of infestation of crops and other situations. The frequency of monitoring could be reduced in the period in which the plants are in a phase of development, sensitive to harmful organisms (for example when the part attacked by the parasite is the fruit and this is not yet present); it should, however, increase when introductions of natural enemies are made and in periods when the harmful parasitic populations are close to the economic damage threshold (ie when their number is high and there is a concrete risk of significant damage to the crops). Determine which areas of the cultivated field to be inspected and the number of plants to be observed. Basically, one should control a number of plants that allow a quick estimate, but at the same time be representative of the whole crop. It is obvious that the greater the number of surveys, the more accurate and reliable the information collected will be, but this, unfortunately, must be reconciled with the time available and with practical needs. In the absence of reference experience, at the beginning attempts must be made until the right number of plants to be inspected is found to obtain a representative sample (in professional agriculture it could be a value that ranges from 2 to 5% of the plants in the field 10-15% of plants in the family garden). As a rule, the location of the detection points should be carried out within a hypothetical grid (chessboard) that allows maintain a good degree of homogeneity in the observations. Determine the parts of the plant to be controlled: this is not an easy transition as it depends a lot on the behaviour and the biological cycle of the organism subject to monitoring and therefore presupposes adequate knowledge on the subject. For example, if you want to monitor the presence of mites, you must control the leaves above all; in the case of thrips and fringes of fruit trees the flowers should be monitored; in the case of the elaterides, however, the underground parts of the plant (roots, tubers, bulbs); in the case of oidium the leaves must be monitored; in the case of the carpocapsa (apple worm) the fruits must be monitored. Furthermore, there are many cases in which it is necessary to control several parts of the plant: for example, in the case of peach cidia, both the young branches and the fruits must be monitored; in the case of most aphids, the leaves, flowers and fruits must be monitored; as regards the virosis above all the leaves and the fruits. Identify a system for data collection that is effective and at the same time easy to use in the field: depending on your needs, you can switch from the notes on simple block notes to the compilation of tables for statistical analysis with the help of a specific computer program. After analyzing the data and drawing the appropriate conclusions, it is necessary to store the information collected in order so that it can be easily consulted when needed. The choice of plant parts to be controlled depends on the behaviour and the biological cycle of the organism being monitored. For example, the aphids on lettuce (3 mm) are to be found on the lower page of the leaves and in the innermost part of the plant. The frequency of the reliefs should increase when natural enemies are introduced, or when the wild ones colonize the plants. It is not possible to check every plant every week, but you must monitor enough to provide reliable information. Unfortunately it is still someone who exchanges an insect useful for the harmful only because it does not look good!